Hello, color lovers! Today I have a beautiful real wedding to share with you guys and I don't know about you, but I'm just absolutely inspired by all the vibrant details! 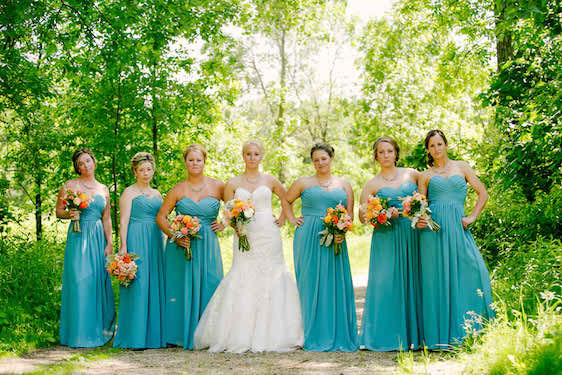 Amanda and Jason had a orange and turquoise wedding at Brackett's Crossing Country Club. Their wedding was filled to the brim with creative DIYs, and lots of fun and personal details. With photography Jeannine Marie Photography and floral design by Judy's Floral Design, this is the kind of wedding where you can just feel the love! Things to be on the lookout for: Those wedding bouquets! Those gorgeous bridesmaid dresses! Those beautiful smiles! And all of these happy, feel-good vibes! And how pretty is this bride and her gorgeous bouquet? And this flower girl and their adorable ring bearer? Cuteness overload! I also love how they incorporated so many meaningful details into their day! The handmade details are some of my favorite! love, love, love! So absolutely pretty, if you ask me! Really love the vibrant orange they used!! Such a gorgeous day! So many beautiful details! Love the pops of color throughout! Simple and yet oh-so pretty! So pin-worthy, if you ask me! Gorgeous, gorgeous, gorgeous! What a beautiful ring shot! Such a lovely wedding, if you ask me! So many pretty details! But really, what I love most is the love that can be felt throughout! Huge hugs and high fives to all the wedding professionals who came together to make this wedding day both beautiful and meaningful! No Comment to " Real Wedding: Bright and Bold with Turquoise and Orange "